Agile software development is inherently democratic. Choice over Prescription could be included in the Agile manifesto. We give the customer the choice, the choice to decide what is most important to them, what will deliver the greatest value and build that first. We do not prescribe that they must build a complex framework first- the software will evolve, You ain’t gonna need it (Yagni) until you need it. The problem with this democracy, with this unleashed choice is that, if you don’t have the right mix of stakeholders, the (agile project) customer doesn’t always know what is best. They are not always the best people to choose. There is a difference between domain knowledge and what I’ll call ‘experience’ knowledge. A banker may know the banking domain inside and out, they can tell you the difference between all the different types of balance and how (and where) they are calculated; closing balance, running balance, etc. But unless they have done any research with customers, unless they have ‘experience knowledge’, when it comes to a question such as which balance to provide as an SMS alert, their ‘domain’ knowledge is as good as your common-sense. Imagine software were a supermarket store. IT are responsible for the construction of the store, the basic layout, the signage, the checkout, the peripherals. The business are responsible for what goes into the store, the merchanising, the planogram. The business imperative is to fill the shelves and shift the product. They want to spend their money to this goal, anything that does not directly support this will be of lower priority. That is their domain and they will prioritise that over anything else. If they could fill the store with nothing but shelves they’d probably be happy. Now imagine visiting the store. There’s no carpark, there are no shopping trolleys, there’s no emergency exits. There’s no ramp for disabled customers. The shelves rise to eight foot high (with no steps to reach the heights), the aisles are difficult to negotiate because of promotional displays between the shelves. The business is happy, but what about the customer? In the agile world, nobody is going to pay attention to this stuff unless it is prioritised. “Sorry, we didn’t build any shopping trolleys because you prioritised building more shelf space over them”. This sort of thing happens all the time; functional domain requirements trump experience requirements. Why? Because no-one brings experience knowledge into prioritization and planning sessions. When stating their choice, your stakeholder wears a commercial hat, they are thinking about their targets and those are based upon shifting product. They are living in thier operational business domain. But cold commercials are not what shifts product. It is the experience that does. Now go back to the democracy of choice on an agile project. Who is the ‘business’ specifiying requirements? Is it a balanced team? Is their an experience champion with an equal voice? Is the voice of the customer recgognised? If not, isn’t about time you got an customer experience champion onto the team. Ability to do bulk price mark-downs? Nice to have. Today we are looking at a large UK supermarket stock control system. At the end of the day the staff mark down prices on the short-life items (sandwiches etc). They have a hand held scanner with a belt printer. Scan item – print label – stick label on item. Well that’s what the process is supposed to be, only this takes time (20 seconds per item) and when you have a whole shelf to do is a chore (12 items takes four minutes). Far easier to just write down the new price on a ‘discount label’ with a sharpie and stick it over the barcode (do the whole shelf in less than a minute). The customer takes the item to checkout and the mark-down label is covering the barcode. The checkout colleague tries to peel it off to scan, but it doesn’t peel cleanly. So she manually enters in the SKU. And the mark-down price. And this has taken 2 minutes for one item and the queue has grown and because of the ‘one in front’ policy they have to open a new checkout and suddenly that small problem at one end of the value chain is replaced by a bigger costlier one at the front end. But had we not observed this we would never know that bulk price mark-downs on the hand-held device is not a nice to have, it is million dollar requirement. A couple of clients I’ve worked with recently have been consolidating their application space, decommissioning old technology and replacing it with a new single application with a core user interface. I’ve written about this before but it is worth revisiting. All too often the starting point is the functionality and the features of the existing applications. The client states we must at the very minimum maintain feature parity, and where the business needs, enhance functionality. Starting with the existing applications and as-is processes is a good start, but never where the focus should lie. The focus should be around the business intent; what are the business goals the system is helping the user achieve? Spending time with the end users of the system is enlightening. It is a crude picture, but this shows what the truth often looks like. 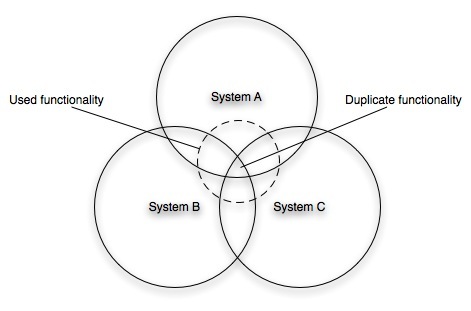 There are three systems that have been developed over the years, commissioned by different business stakeholders with different budgets and different delivery teams. Of each of these systems only a fraction is ever used. (This is especially true of vendor products that have requirements rooted in the market rather than the specific needs of that organization. Think about how many of the features in Microsoft Word you use). If there is significant functional redundancy in the applications, there is also duplicate functionality that results from the different development legacies. It is not unusual in such a landscape for the user to enter the same data into each system. Not something you would wish to replicate in a new world. In building a new application, the place to start looking for requirements is not so much the as-is processes or existing applications. The place to start is the business intent and what the business actually wants the system to do. More importantly, that means starting with an open mind and challenging notions of process complexity. 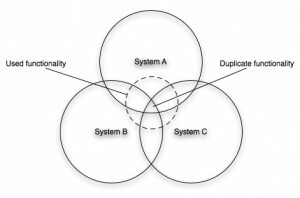 Is the process complex because it really is, or because the current systems make it that way? In my experience, more often than not, it is because of the former. Spend time with end users, see what they do today. By asking seemingly stupid questions, taking a starting position that the process is simple and challenging ‘why not?’ can yield valuable insights. By all means consider the as-is world, but don’t let it cloud your judgment in designing ‘to-be’. Last year, according to Gartner, with belts tightening, technology executives need to focus upon disruptive technologies (that cut costs). The top ten list of disruptive technologies makes strange reading. How will social computing and mash-ups cut costs (enterprise 2.0?) Most interestingly, coming in at number six on the list is “user interface”. Now let’s leave aside the fact that a “user interface’ is hardly a technology (it is how technology manifests itself to the user) I’m interested by the fact that it can be considered to be disruptive. What is disruptive about user interface design? But think a little further. What is really disruptive is the realisation that good design is more than just adherence to functional requirements; good creative design is more than ‘bells and whistles’ or ‘gold plating’. A good user interface will cut costs by enabling the internal user base be more efficient and productive. A good user interface will enable customers to succesfully complete their transactions / goals. In a world where poor UI on enterprise applications remains, maybe user interface is indeed a disruptive technology after all. What is the likely traffic that will hit our site during the offer and will our system be able to handle it? Dr. Pepper said that they’d give a free Soda to all Americans if Guns’n’Roses released their new album this year. They did and the drinks company held up their promise, setting up a website offering a free coupon for 24 hours (if you signed up). They turned a throw away comment to their advantage and this could have been great PR. Only they didn’t predict the volumes that would hit the site, it couldn’t handle the traffic and went down for most of the day. Cue panic extension of the offer, unhappy customers, unhappy Axel Rose, PR disaster and lawyers on the prowl. If only they’d remembered to think about NFRs. Does enterprise IT know what Google is? Imagine an investment bank, a trader has a requirement for a tool to screen stocks. The requirement is to select stocks based upon different parameters, so for example find companies with a market capitalisation between a selected range, and a P/E ratio, Dividend Yield and Net Profit Margin between other selected ranges. And maybe the ability to add additional parameters. Typically the process will be for these requirements to be captured by the Business Analyst who acts as the conduit to the development team. Nowhere is the user interface explicitly referenced – it will almost certainly be articulated in the reality of the current systems; what the BA knows and understands. Despite the iterface being delivered through a browser, the developers are not web developers. Inevitably the finished product will be functionally correct, it meets the requirements, but it will be clunky: select parameters > search > results… because it reflects the requirements as the trader put them “I want to do this and this and this, press a button and get a list back“. So what are the chances of an internally developed investment bank application looking like Google finance’s Stock Screener? And what would your trader rather have? Why are we building this application? What will deliver the greatest value in the shortest timeframe? Once the requirements of the business are understood, and framed in terms of their business value, then (and only then) should we turn to the technology. This can often be a challenging message; IT professionals like to think in terms of architecture and platforms, yet often these constrain the ability to truly deliver what the busines really needs. The development team may be a Java shop and only does Java, yet the end users live in a world of Microsoft. So what happens – IT develop user interfaces that expose data in a web browser only for the business users to copy and paste it into the tools of their trade – Microsoft Office. And because IT only do Java that’s the way it has to be. Value is lost in this thinking. It is easy to argue on the cost to expand the team requiring new skills by introducing .net into the architecture. But what is the cost to the business of time spent through inefficient work practices? All to often IT is an end unto itself, rather than the means. IT needs to remember it only exists to enable organisations. The most refreshing CIOs are those that recognise this. Those who focus upon delivering business value and question every big decision – what value is this giving to the whole organisation rather than thinking in terms of their IT silo. In fact, the sort of way that ThoughtWorkers think.